The front door is often the focal point of a house and the welcoming committee to guests as they enter your home. And as the attention-seeking centerpiece, it should always be looking its best. 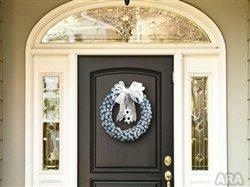 A great addition to any door is a beautiful wreath – either decorative or seasonal – to greet your guests and neighbors. Although many stores sell wreaths, it’s easy, fun and cost-effective to create a unique and one-of-a-kind statement piece. Need some inspiration? Here are two stylish and simple do-it-yourself wreaths to impress everyone who stops – or even passes – by your humble abode. As the winter season approaches, outfit your front door with a beautiful wreath full of festive snowflakes. No matter how cold it gets outside, this wreath will provide a warm welcome. Here’s what you’ll need: a round craft foam wreath; ribbon; two wooden snowflakes; blue glass-headed pins; two pieces of letter-size cardstock; different styles of snowflake paper punches; scissors; a hot glue gun and glue sticks; Krylon Glitter Blast in Diamond Dust, Sapphire Shimmer and Clear Sealer; and Krylon Indoor/Outdoor in Global Blue and White. Everyday items, such as pencils, can become beautiful design statements. With a little spray paint and creativity, you can transform pencils into a trendy sunburst wreath that looks like it came from a department store. Here’s what you’ll need: Krylon Short Cuts Paint in Gloss Black; a craft foam 1-inch by 2-inch by 12-inch round, flat wreath; 64 pencils; 10-inch-length wire; glue gun and glue sticks; a floral pin; and a black marker. Start by dividing the foam ring into eight equal sections, marking them with the black marker. Using them as a guide, gently press a pencil down on the foam, spacing each groove every half inch creating 64 indentations – or eight per marked section. Once all indentations are made, spray the entire wreath black. Use a spare box to elevate the wreath while painting – this will make it easier to spray without missing spots. After the initial coat of paint has dried, attach the pencils using the hot glue gun. Stagger the placement of each pencil, with some closer and some further from the center of the wreath to create a “short-tall” pattern. When all the pencils have been attached, spray the entire wreath with black spray paint. Once dry, carefully flip the wreath over and spray once more for even, full coverage. Then, glue and pin a loop of wire to the center back of the wreath to create a hanger and you’re ready to display your sensational and simple work that’s perfect for any time of year. For more craft ideas from Krylon, visit www.krylon.com.